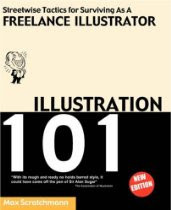 This guide to the ins and outs of today's dynamic illustration business tells budding illustrators everything that their teacher didn't know or their art director didn't tell them. 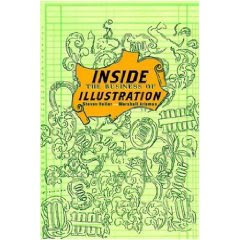 Using an entertaining, running narrative format to look at key concerns every illustrator must face today, this book covers finding one's unique style and establishing a balance between art and commerce; tackling issues of authorship and promotion; and more. In-depth perspectives are offered by illustrators, art directors, and art buyers from various industries and professional levels on such issues as quality, price negotiation, and illustrator-client relationships. The second book is more like a how to be an illustrator style tome. 'Illustration 101' by Max Scratchmann (real name? I doubt it!) This is a straight talking shoot from the hip style guide which is full of practical advice on all aspects of professional practice.